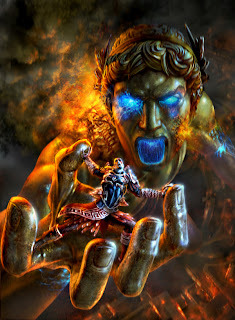 Andy Park Art: GOD OF WAR 2!!! It's almost here! I've been working at Sony Santa Monica Studios since mid-2005. It's been the best experience. I was one of 6 (7 at one point) concept artists coming up with the look of the game- characters, creatures, environments, props, storyboards, color keys, whatever else they needed. It was great to be able to contribute to some marketing images as well. This is one I did that ended up being used for the cover to the game demo that recently came out as a teaser to the actual final game, which is set to hit stores on March 13, 2007.